Good morning everyone! I have a super fun December planned for you all and I’m so excited! I have a ton of great DIY snacks, crafts, and even a few video glimpses into our daily lives here at the Confessions household. So if you’re ready to embark on an exciting and festive holiday season with me, stick around! Today I have a very easy, and I mean easy, but absolutely adorable Santa Hat Snack for you. This recipe is great for kids, and it makes a wonderful treat for all of those holiday parties coming up. I found this idea on pinterest. I couldn’t resist trying it out, and I’m so glad that we did, because it was delicious! 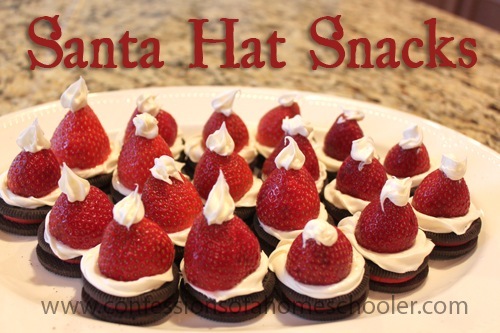 If the video doesn’t work in your browser, you can watch the Santa Hat Snack video here! Wash your strawberries, then slice off the stems and set aside. Set your Oreos out on a festive plate. Pipe frosting onto the tops of each Oreo, then top off with a strawberry. Add a dot of frosting to the top of each strawberry and you’re done! I hope you enjoy these cuties, they’re not only amazingly easy, but they taste delicious! Yay! PS. If you choose to make these, send me some pics on instagram with #coahchristmas so I can see! These are darling! But I can’t imagine finding decent tasting strawberries this time of year. I wish I had an idea for a seasonal alternative. Anyone? Actually ours were really good still!